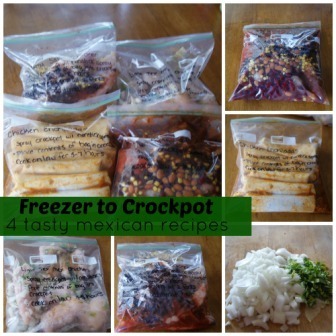 Welcome back to Freezer To Crockpot Cooking – Mexican Week! You had a few days to get all the ingredients for these Mexican recipes togetherand now it is time to prep your ingredients for those delicious Mexican inspired chicken dishes! Finely chop cilantro so that you have 2 Tbsp chopped cilantro. Cook 2-3 large chicken breasts however you prefer, bake, boil, poach or pan fry. Shred chicken, combine in a small bowl with 1 can of enchilada sauce, evenly distribute among 6 tortillas, fold in ends, and roll up. And that’s it! You now have 4 homemade and healthy healthy meals, ready to go in your crockpot on those busy days! I’m a little confused. What do I put in the chicken enchiladas? It says filled tortilla shells, but what do I fill them with? Thanks, these recipes look good and fast! My two favorite words when it comes to dinner! I was wondering, are we to cook the chicken before freezing? Or are we adding the chicken raw in the bag with all the rest of the ingredients? Thank you! chicken is one of the only meats that cooks just fine in the crock pot from frozen….so go ahead and throw the chicken in the bag raw! Hi there. Like the recipes, but I am finding I have to search all over for the information needed. It would be helpful if each individual recipe listed the ingredients and steps. Thanks. I bought the ingredients for chicken, beef and Mexican weeks today. I just finished writing the instructions on my bags. My question is… I understand that if I want to lower the sodium content I should drain and rinse the canned beans/corn. But if I am not worried about sodium, do I stil need to drain the cans if the liquid? If I do drain and rinse, do I need to add water back? If so, how much? Oh – no go ahead and drain and rinse the beans and corn. I can’t think of a time that I ever used canned beans without draining and rinsing them! Thank you for answering so quick! I got home from the store at 7pm and by 10:30 pm, I had 12 bags labeled w/directions and 3 meals in the freezer! LOVE IT! That is now many meals that you don’t have to worry about prepping!